Southern California, where we used to live, is famous for a lot of things, but not for growing blackberries. The grocery stores there seem to think that summer berries are gold, not food, and charge accordingly. Here in the Pacific Northwest, berries grow like weeds. In fact, blackberry vines are weeds all over our new State, including in our own yard. At least two of the five acres we live on are covered with the vines. It’s fun to go out to the yard, pick the succulent berries, and eat them while they’re still warm from the sun. Björnbär, Swedish for blackberries, has a profusion of berries across the back of the hand, and stars strewn across the palm and thumb. 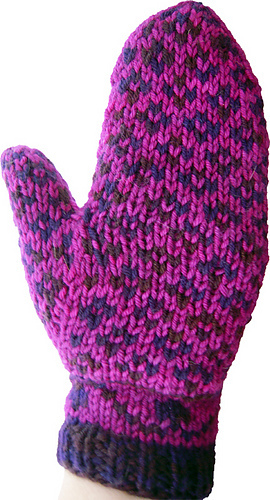 Knit in the round from cuff to fingertips. Yarn: Worsted weight; 100 yards MC, and 50 75, 100 yards CC. 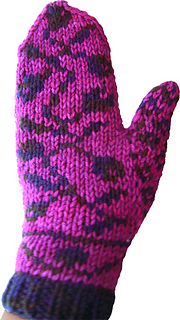 Skills: two-color knitting in the round, k2tog, ssk, grafting. Other supplies: 1 stitch marker required (more markers are optional), smooth thin waste yarn in contrasting color, yarn needle.